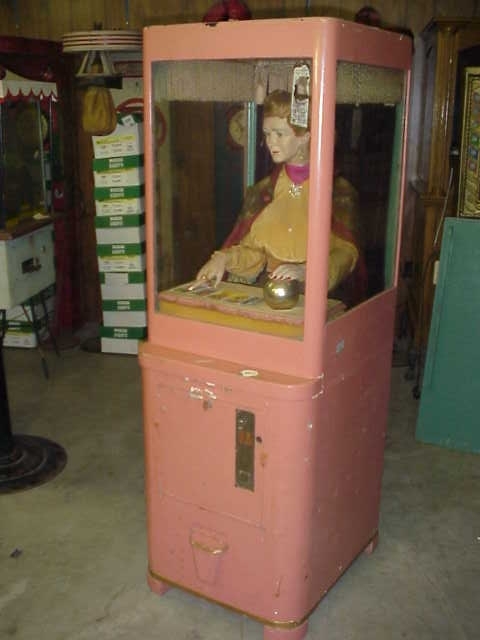 Original Mike Munves Grandma fortune Teller in good original condition. A lifelike movements make the process appear to be alive and give her fortunes. Doraldina Corp. 1928. 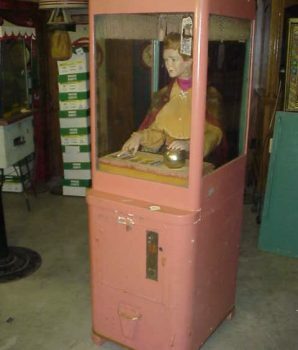 One hand moves over the cards and other hand moves over the crystal ball, head goes from side to side, eyes move, and the chest “breathes”, crystal ball glows as the machine dispenses a fortune card. Full size Grandma, life size with human movement (chest, both hands, eyes, head). The crystal ball glows once coin is inserted. She will scan the cards for a peek into your future, and then a fortune card will drop for the player. The wise old grandmother passes her hands over the cards and stops at the proper fortune. A card falls into the tray by the William Gent Mfg. 1929.